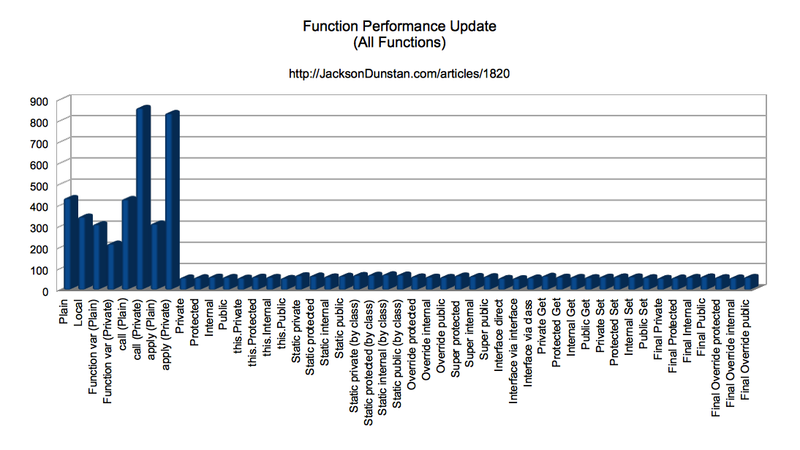 Above all others, there is one article I refer back to most: 2009’s Function Performance. It was updated for Flash Player 10.1 and 10.2, but not 10.3, 11.0, 11.1, or 11.2. 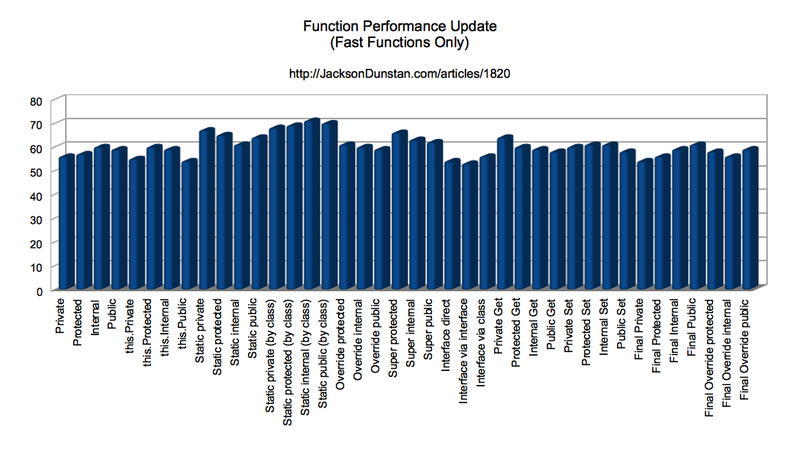 Today I’m updating this article for Flash Player 11.2, adding some missing function types, and including a set of graphs to make for the ultimate function performance reference. 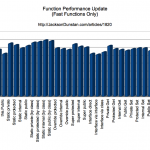 Split apart “dynamic” function tests: local function, function variable, “plain” function (i.e. in the package but not in the class). Thanks to Skyboy for the tip. Here are the graphs of these results. The first is for all functions, the second for just the “fast” functions (there is an obvious divide), and the third for just the “slow” functions. Even since Flash Player 11.1 in January, we now see calling static methods via a class name (i.e. MyClass.foo() is just as quick as not using the class name. Using a Function-typed variable (e.g. as with most callbacks) or using the call or apply methods of Function dramatically slows down the function call (by at least 2x). While the “slow” class of function types are all indeed slow, calling non-dynamic functions like private methods via call or apply are much (4x) slower. I hope this article serves as a good reference when you’re considering the performance of a certain type of function; I know its predecessor served me well. If you’ve spotted a bug or have a suggestion, please feel free to leave a comment. Hei. May I “request” function calls via custom namespaces (which might be a common for libraries/frameworks)? Function call in a custom namespace on specific (strong typed) object and on interface-typed object. 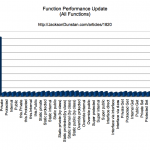 Am glad they pumped up the perfomance on static function calls.